In our efforts to rebuild communities that are more inclusive and equitable, we need to remind ourselves of the positive effects of group work and how distinct environments (i.e., “green spaces” and community gardens, forests, etc.) can help influence a greater degree of community unity, connectedness, and self-worth. Our own evolutionary history has shown us that nature has both calming and healing effects when we begin work from an interactive and cooperative perspective. In this sense, then, we are both stewards of the community and tenants of the Earth in providing a healthy environment in which we all share. 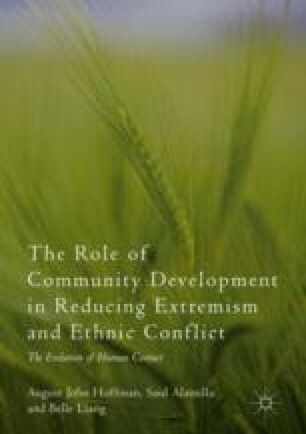 Continuous themes addressed throughout this manuscript involve extremism, violence, and the unique role that communities have in helping groups of individuals realize their potential and work within a more constructive and cohesive process that brings them together. Exposure to specific types of environments (i.e., “green spaces,” community gardens, and urban forestry programs) has been identified as key elements in promoting mental (and physical) health benefits, such as reduced stress and anxiety, as well as improved sociability and civic ideologies that foster and promote interactive and democratic processes in community development (Glover, Shinew, & Parry, 2005). Let the Heavens rejoice, Let the Earth be glad … Let the Sea resound, and all that is in it. Let the Fields be jubilant, and everything in them … Let all of the Forest sing for Joy.